"This is a wonderful, chewy, just a little different oatmeal cookie. I have made them with many variations and all of them good. They taste the best if the raisins soak in the coffee liqueur overnight." Place raisins in a small bowl, and add coffee flavored liqueur. Heat in the microwave for approximately 2 minutes, or until hot. Set aside to cool (overnight is great). Drain, and reserve liquid. In a large bowl, cream together shortening and brown sugar. Beat in eggs, one at a time, then mix in milk and the reserved liquid from the raisins. Combine flour, baking powder, baking soda, and salt; stir into the creamed mixture. Stir in oats. Mix in the walnuts and white chocolate chips, if desired. Drop by rounded spoonfuls onto prepared cookie sheets. Bake for 8 to 10 minutes in the preheated oven. Allow cookies to cool on baking sheet for 5 minutes before transferring to a wire rack to cool completely. These chewy oatmeal raisin cookies are spiced with cinnamon and cloves. I just made these last night. The house smelled delicious! -And the cookies, were awesome! Soft and comforting. 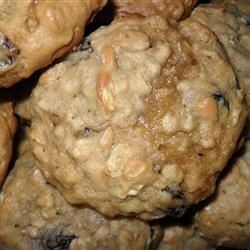 A little more trouble than conventional oatmeal cookies, but definately worth it. Lots of stuff to be added by kids...they love that!